School fundraisers aren’t always particularly welcome when you’re trying to be eco friendly. Selling a bunch of wrapping paper, cookie dough and so forth doesn’t always appeal that much. It’s a bunch of money parents, extended family members, friends and coworkers can get tired of spending. 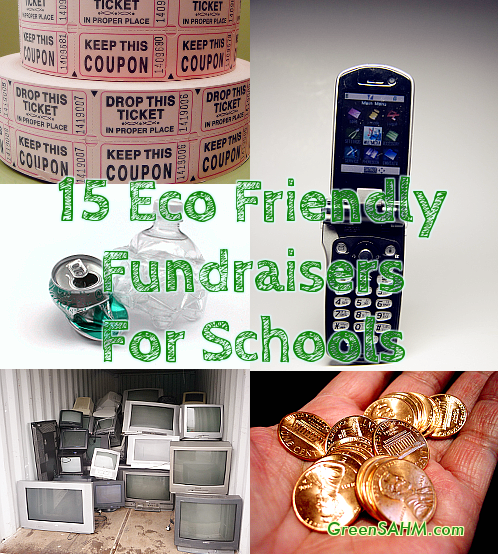 Schools willing to step outside that box, however, have some interesting options for eco friendly fundraisers. My kids’ school has done an electronics recycling fundraiser two years in a row now. While I don’t know anything about the quality of the company they go through, I think this is an excellent concept. It keeps electronic waste out of the dump and allows the school to raise money, yet families don’t have to spend any extra money. The one our school does is a one-day event, where everything is dropped off during the listed time frame, although the school can also allow pre-collection so that some stuff is there already. There are also programs out there for ongoing fundraising by collecting and recycling electronics, such as through Recycling Fundraiser, Funding Factory, and others. Goodwill in Southern California has a donation drive program where schools and other nonprofits can earn money for every bin filled. I believe it’s available elsewhere too. This is a nice way for the school to earn money while families get rid of the junk that accumulates in most homes. And once again, you don’t have to buy anything for your kids’ school to raise some money. Have students ask friends and family to sponsor them at a cleanup day at a local park, beach or another natural area. Encourage people to give either a rate per pound cleaned up by the student or a flat rate they will give the student for participating. This way the school and a natural area in your community both benefit. Schools can earn money by recycling aluminum cans and plastic bottles for the money. This one takes a lot of space, however. Just look for local places you can take the goods or see if any places will pick up when there’s enough collected. For schools with less space, you can also collect just the tabs off aluminum cans. They don’t take much space but can add up to some reasonable money for the school. You can participate in the Great American Can Roundup if there are buyback locations in your area. If you want to go beyond the usual recycling programs, Terracycle has a Brigade program where various items can be collected, and the money donated to a nonprofit or school that you select. They have 40 programs to choose from. Some have a cost, but others are free, right down to the shipping. This one takes a fair bit of space, of course, as it takes time to collect enough waste to send in. The programs can fill up for a time as well, and you may have to wait for the right one to open for your school. They offer programs for drink pouches, baby food pouches, printer cartridges, electronics and much more. These are a good way to encourage the kids to get active while raising money. Have them get family and friends to sponsor them to raise money for the school. This can be just about any activity the kids can do – walking, running, dancing, whatever. Keep it simple to keep the costs down. Yes, eventually it comes back to buying. Still, I like the Smencils fundraisers. Smencils are scented pencils made from recycled newspapers, and kids go nuts for them. Best of all, pencils are things students absolutely need, not just junk. As pencils go, they’re pricey, but they make a nice treat for the kids. Best of all, at our school it’s usually students running the fundraiser under a teacher’s supervision, selling to other students to fund a field trip, not something to take to work. Smens are also available. Scrip has been around for a very long time. Basically, it’s buying gift cards to stores you already shop at through your school, including many grocery stores. The school gets a percentage (varies by store), you get to spend the same amount you would have anyhow while benefiting your school. Shop With Scrip and eScrip are two options. You can also sign up directly with certain stores, such as Target, to have a percentage of your purchases go to the school of your choice when you use their card. Schools can join the Amazon.com Associates Program and earn a percentage of sales on purchases made by people who click through their link. The challenge here is getting people to remember to get to Amazon through the school’s link, not through bookmarks or just typing it in. Not everyone approves of this, as some feel that it takes money away from local businesses that would come back to schools through taxes, but many people are going to shop through Amazon anyhow. iGive is a program your school can sign up for, then go through the iGive button or download the app for their online shopping. iGive partners with many online stores, and a percentage goes to the school. The wonderful part about an online fundraiser is that it’s not limited to local friends and family. Anyone you know who is willing to use your school’s links can participate. Families can share links through email as well as social media such as Facebook. Encourage families to donate their spare change to the school. A jar can be placed in the school office as well as at any businesses willing to help out. As anyone who has collected their own spare change knows, this can add up fast. A fun way to do this is called Penny Wars. My kids’ school does this every year. Every grade has a bucket in which they collect change. Every penny is a point. Any other coin subtracts points up to its face value, such as -5 points for a nickel. This allows grades to sabotage each other. The kids get very competitive about the whole thing. The wonderful part about Penny Wars is that it has very little overhead. The school gets all the money, and the buckets can be reused from year to year. The winning grade gets a prize. Our school does a pizza party for them, sponsored by a local pizza place. This program has been around for a long time. Families can collect the box tops off products they purchase anyhow and turn them over to the school, which then gets money for them. 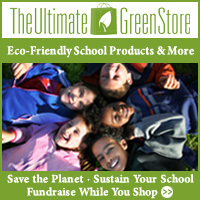 The products are not necessarily healthy or eco friendly, but we’re talking about things most families will buy anyhow. Have families donate goods they would otherwise send to a charity or sell at their own garage sale, and have a huge rummage sale at your school. Make sure to promote the rummage sale on social media, especially local for sale pages and Craigslist. Make and post signs if they’re allowed in your area. The hardest part about this idea is getting and storing the goods donated for the rummage sale, and handling disposal afterward. The best thing to do with leftovers is to have arrangements made to donate them. Try to have them picked up very shortly after the sale so the school doesn’t have to deal with storage for long. A rummage sale requires a lot of volunteers and time. Try to involve both parents and students. It’s a good experience for the students, especially if it’s for something specific to their class. Help parents quit the disposable habit by selling reusable lunch bags, containers and drink bottles. One Small Step, Planet Wise, ECOlunchbox, and others offer fundraising programs. 14. Fair Trade Chocolate, Coffee, etc. Chocolate and coffee are fun to sell, although there’s always the risk that you’ll enjoy it too much yourself. There are a variety of companies that offer Fair Trade chocolate, coffee and other goods for fundraisers, such as Dean’s Beans, Equal Exchange and Grounds for Change. Help families in your area grow better gardens by selling non-GMO and/or organic seeds. Sow True Seed, High Mowing Seeds, EcoFlower Fundraising, Botanical Interests and the Online GreenHouse offer fundraising programs. Some programs offer seed packets with flowers that are good for attracting bees or butterflies, as well as other types of seeds.